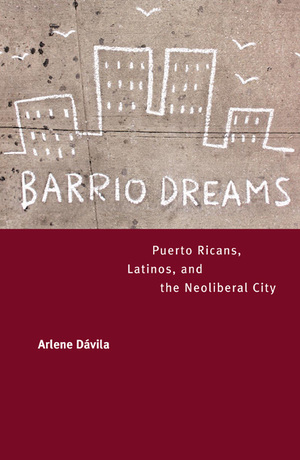 Arlene Dávila brilliantly considers the cultural politics of urban space in this lively exploration of Puerto Rican and Latino experience in New York, the global center of culture and consumption, where Latinos are now the biggest minority group. Analyzing the simultaneous gentrification and Latinization of what is known as El Barrio or Spanish Harlem, Barrio Dreams makes a compelling case that—despite neoliberalism's race-and ethnicity-free tenets—dreams of economic empowerment are never devoid of distinct racial and ethnic considerations. Dávila scrutinizes dramatic shifts in housing, the growth of charter schools, and the enactment of Empowerment Zone legislation that promises upward mobility and empowerment while shutting out many longtime residents. Foregrounding privatization and consumption, she offers an innovative look at the marketing of Latino space. She emphasizes class among Latinos while touching on black-Latino and Mexican-Puerto Rican relations. Providing a unique multifaceted view of the place of Latinos in the changing urban landscape, Barrio Dreams is one of the most nuanced and original examinations of the complex social and economic forces shaping our cities today. Arlene Dávila is Associate Professor of American Studies and Anthropology at New York University. She is the author of Latinos, Inc.: The Marketing and Making of a People (California, 2001) and Sponsored Identities: Cultural Politics in Puerto Rico (1997) and coeditor of Mambo Montage: The Latinization of New York (2001).